On Sunday April 7, 2019, Colorado OPO Donor Alliance was officially recognized for excellence by the National Institute for Standards and Technology (NIST), a part of the U.S. Department of Commerce. NIST promotes innovation in the U.S by advancing standards that improve quality of life. 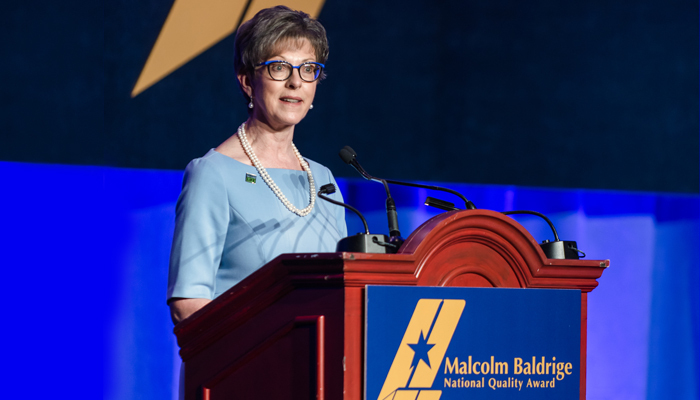 Donor Alliance CEO Sue Dunn accepted the 2018 Malcolm Baldrige National Quality Award at the 2019 Baldrige Quest for Excellence Conference at National Harbor, Maryland. Dunn also serves as president of the OPTN Board of Directors and UNOS Board of Directors. Secretary of Commerce Wilbur Ross presented the honor to Dunn, who leads one of the top-performing organ procurement organizations in the U.S.. The only non-profit organization recognized this year, Donor Alliance is also just the second OPO to receive the Malcolm Baldrige National Quality Award (Mid-America Transplant Services was honored with the award in 2015). The Baldrige Performance Excellence Program raises awareness about the importance of performance excellence via training and education, organizational assessments, and the sharing of effective practices through its national and regional award programs. Says Dunn, “At Donor Alliance, we have actively been on the Baldrige journey for the past nine years, since 2010. It really works for us because we like the emphasis the Baldrige framework gave us—it identifies and requires that you do an in depth analysis of six key areas of your organization—leadership, strategic planning, voice of the customer, knowledge management, our workforce, and operations. They are processes that make any organization successful. “One of the ideas that we’ve gleaned from Baldrige is to actively focus on innovation and looking for ways to bring change and improvement.” In 2018, Donor Alliance recovered 160 organs, an 11 percent improvement over 2017. Learn more about the NIST Baldrige Performance Excellence Program and Donor Alliance. Donor Alliance is one of 58 federally designated non-profit organ procurement organizations in the United States. Visit DonorAlliance.org for more information.